When I first started brainstorming ideas for Thanksgiving dishes I could prepare on a panini press, this one was actually the first to pop to mind. It’s the simplest of all the dishes I’m sharing and, arguably, makes the best use of the press. Grilling the acorn squash on the panini press is much faster than roasting – this dish took only 30 minutes, start to finish. Plus, I think the grill marks are actually kind of pretty too (especially with the dark scalloped edges of the acorn squash). It sounds cliché to say it, but the cranberry-ginger maple syrup really does taste like the holidays. It’s sweet, fruity and gingery all at the same time and works wonderfully with the naturally sweet acorn squash. In the unlikely event that you have syrup left over, someone please try it on some pumpkin pancakes and report back! I have a feeling the combination would be out of this world. Speaking of those dark scalloped acorn squash edges…the question of whether to eat the peel or not arises. Everything that I’ve read seems to indicate that while it probably isn’t harmful to eat it, many people just choose not to do so. Just cut away the flesh with your fork or go ahead and pick up the slices with your hands and eat ’em like melon (I won’t judge!). Slice the acorn squash in half lengthwise and then slice it into 1/2-inch thick slices crosswise. Working in batches as needed, brush melted butter onto as many slices of squash as will fit on your grill. Place the squash on the grill, buttered side down, and brush more butter on the other side. 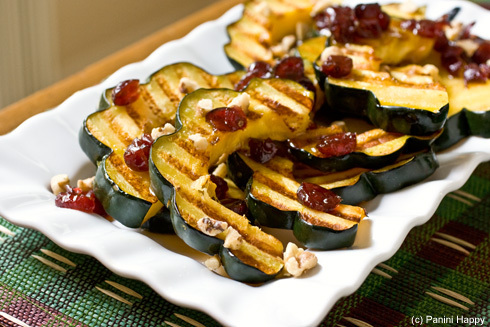 Close the grill so that the upper grates make contact with the squash without pressing it. Grill the squash until it is tender and dark grill marks appear, about 7 minutes. Transfer to the squash to a serving plate and cover the plate with foil to keep the squash warm while you grill the remaining batch(es). While the squash is grilling, bring the maple syrup, cranberries and ginger to a boil in a saucepan over high heat. Turn down the heat to medium-low and simmer for 2 to 3 minutes. Remove the syrup from the heat. 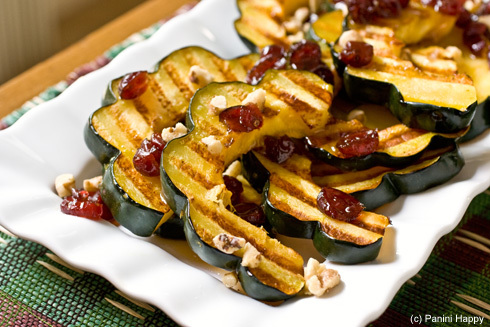 Drizzle the cranberry-ginger maple syrup over the squash and garnish with toasted walnuts before serving. This is beautiful and has some of my favorite fall flavors. Loving your grilled Thanksgiving, Kathy. These look great! I love how you are making a whole Thanksgiving on the panini press. I’m really enjoying this series. It’s made me think of my panini press in a whole new way. You are a panini press genius, Kathy! How pretty and festive looking – the grill marks make these look so much more interesting! I can definitely say I’ve never thought to make acorn squash – let alone an entire Thanksgiving meal – on the panini press! So creative. This looks delicious. Love this idea! Acorn squash looks so pretty with grill marks! I liked the dish because it was sweet – it almost tasted like a dessert! My mouth is hanging open. What a clever idea! The grill marks are gorgeous & I’m sure taste fabulous!